Sonic Generations finally released last week and most of you probably don’t even care. And who’s to blame you? The last…decade maybe of Sonic games have been awful. Although, Sonic Colors was pretty good. Too bad it was only on the Wii and DS, pretty much ruining any legitimacy it might have gained. Sonic Generations however is really awesome. But that’s not what this post is about. It’s about a fan made Sonic game that I played some time ago and was disappointed because it never came to full fruition. Back when I first heard they were doing a Sonic 4, I started to do some research to find out release dates, style, graphics, etc. and I stumbled upon the Sonic Fan Remix. After seeing only a couple of screen shots, I immediately sought out a demo. The project was being lead by Pelikan13, who has unfortunately stopped production. Despite only releasing a couple demos with a few playable stages, the fan remix was still loads better than Sega’s official Sonic 4 release. A lot of things kept that game from being a good side-scroller; the momentum in Sonic 4 felt all wrong for starters, and overall I don’t think it really recaptured the essence of its 16-bit ancestors. Sonic Fan Remix just feels right, like putting on a pair of socks fresh out of the dryer on a cold winter day. 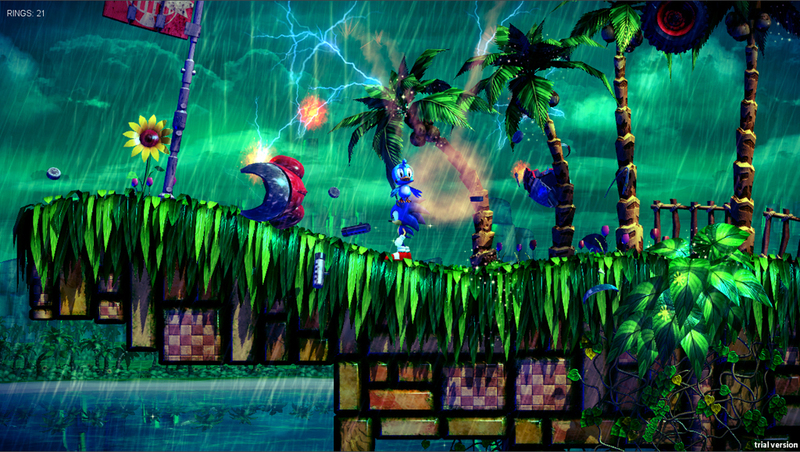 SFR has vibrant colors, great lighting effects, weather effects like rain and wind in the trees, it has more lush backgrounds and foregrounds (though some say it’s too overpopulated with stuff), and mainly just feels more like an authentic Sonic game. Pelikan13 has said that it’s possible he may return to the game at some point in the future, but I won’t hold my breath. Like too many fan made and indie games, it will probably never see completion. I guess I understand. Making a game for free doesn’t pay the bills. Check out the Sonic Fan Remix homepage for some screenshots and a video. Unfortunately the download link there doesn’t work anymore. A lot of hosting sites I’ve seen have taken down the demo, but it’s still accessible on fileplanet and various other sites. But here’s a favor. I’ve got the link directly to the download right here. This is the most complete version I’ve seen. It’s got 3 stages in the Emerald Hill Zone, the first zone from Sonic 2. There’s also a less complete demo of the Chemical Plant Zone which you can download here. Both are executable files with nothing to install. So take a few minutes and enjoy the demos and if you like them, let Pelikan13 know. Maybe with a big enough push we can see a complete remake. Posted on November 6, 2011, in Indie Games and tagged sega, sonic, sonic 4, sonic fan remix, sonic the hedgehog. Bookmark the permalink. Leave a comment.